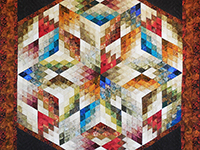 Another very clever C Jean Horst quilt -- For those of you who are quilt makers, you will understand the term Disappearing hourglass when you sew 4 squares into one block and then recut it into different sizes and sew it all back together again. 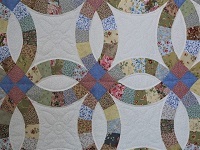 What an amazing way to make these quilt blocks. 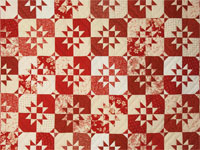 The 100% quilters cottons in reds and creams, when rearranged, form the little stars you see throughout this pattern. How beautiful and perfect this method works. It accomplishes the goals of our quilt making skills. 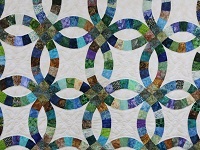 The hand quilting which is about 8 tiny little hand quilted stitches per inch shows beautifully as it makes a charming outside design around the 4 borders of the quilt. Do not miss all those beautiful designs on the outer border. Subtle and sophisticated! A WOW of a Wedding Present! 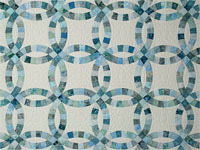 Note the interesting collection of 100% cotton soft pastel prints selected for this quilt. Will work well with many coloring schemes. 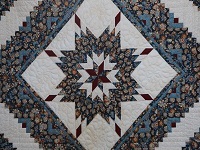 Well pieced and quilted by a Lancaster Amish woman. Signed and dated by its creator, the well respected quilt designer, C Jean Horst of Lancaster. 100 inches wide by 112 inches long -- $845. 98 inches wide by 114 inches long -- $795. 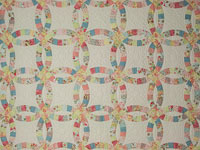 A Double Wedding Ring Quilt is a all-time favorite and this quilt is done in lovely pastel colors. 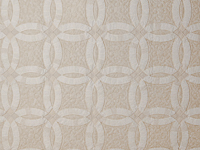 The background is a tone on tone cream white cotton print. Was pieced and quilted by Amish women. 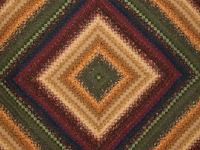 This quilt is made from scrappy fabrics so no quilt is ever the same, and the binding used on this quilt is off white This quilt is symmetric and may be used sideways on a king size bed. 100 inches wide by 114 inches long -- $945. Wow! C Jean Horst has outdone herself with this quilt -- 36 different 100% cotton country prints are used from beautiful classic colors!! 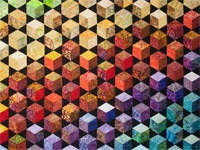 This patchwork is made up of over 6205 postage stamp size pieces. Lovely and amazing. Made here in Lancaster by an Amish woman. This quilt is signed in pigma pen ink on an attached label on the back by C Jean Horst. All Jean's quilts are American made and have a documentation label sewn into the back corner with the name of the quilt, quilter's name, 100% fabric content and Made in USA.